As soon as the last American fighting solder left Iraq, the government of Nouri al-Maliki hinted that it will work for reconfiguring the government from one that is coalition based to one that is majority based. He also encouraged some lawmakers affiliated with al-Iraqiyya to break away, some did. In the meantime, a court issued an arrest warrant against Tariq al-Hashimi, the Sunni Vice President, on charges of ordering over 150 terrorist attacks against civilian and military targets. Al-Hashimi and his family are now under Turkish protection after escaping via Kurdistan>Qatar>Saudi Arabia. Allawi is also out of the country and refuses to return unless al-Maliki steps down. A Kurdish leader, Mas`ud al-Barazani visited the U.S. and Turkey in the last several weeks. 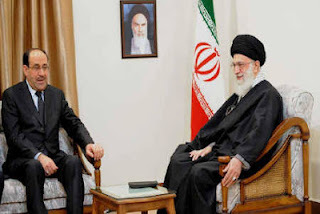 On Monday April 23, al-Maliki started a two day visit to Iran. Publicly, the Turkish Prime Minister, Recep Tayyip Erdoğan, accused the Iraqi Prime Minister of pursuing a sectarian policy. Barazani, the president of the Kurdish autonomous region, threatened to secede if the central government does not agree to its demands. Al-Maliki reacted by accusing the Turkish PM of interfering in Iraq’s internal affairs. Some polls suggest that these tough stance raised al-Maliki’s popularity especially among Shiite Iraqis who constitute about 65% of the population. Ethnic and religious tension is still a major factor in governing Iraq. But this is indicative that the region is going through major geopolitical transformations. Turkey’s embrace of al-Hashimi and its improved relations with Kurdistan is portrayed as a threat to the central Iraqi government. Turkish leaders could be sending a signal that, in the case of a conflict in Iraq, Turkey will take the side of the Sunnis--including the Iraqi Kurds. Al-Maliki on the other hand, may not seem too concerned with the issue of an independent Kurdistan. Perhaps he reasoned that an independent Kurdistan is more of a threat to Turkey than it is a threat to Iraq. Maliki’s visit to Iran will answer the question of how the Iranians feel about an independent Kurdistan. Syria is too busy fighting the Saudi and Qatari sponsored rebels to worry about its own Kurdish problem. For al-Maliki, given that the majority of the oil wells are in southern Iraq, perhaps al-Maliki would like to unload Kurdistan to get rid of a political and economic headache. In the end, this may all be political posturing. It will be interesting to see who will blink first: al-Maliki or Erdoğan. Based on current Turkish reasoning, unless Turkish leaders are now willing to make concessions to Turkey’s own Kurdish people, an independent Kurdistan in northern Iraq is not in Turkey’s interests. In the end, the definitive question becomes, is Turkey more willing to live with an independent Kurdistan than is Iraq willing to live without the Kurdish region?